I've made some video tutorials that show how to program with FLTK. These videos have sound, so turn up your speakers if they're off. These videos assume you have some knowledge of C++. example programs, useful to both new and experienced FLTK users. How were these videos created? In 2004 with "Camtasia" from TechSmith. Why did you use Flash videos instead of YouTube? YouTube didn't exist when these videos were made. So you no longer need flash to view them. The original Flash videos are still available, see each video's separate page for details. 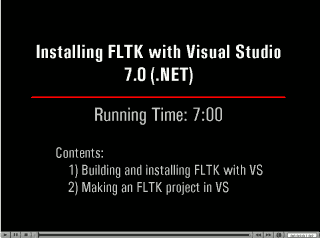 How to download and build FLTK using Visual Studio. How to make a new FLTK project of your own. To download this video for local playback, right-click on this link to save. There is also a youtube version of this video. How to write and compile "Hello World". Making button callbacks, passing user data. Deriving a class from Fl_Window. 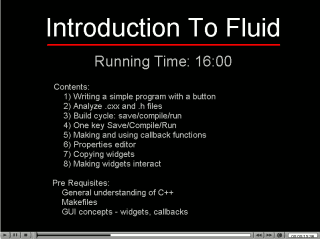 Fluid is FLTK's interactive widget layout and programming tool; a very terse but effective IDE. How to make a simple program. Save/Build/Run cycle with one keystroke. All contents on this page © Copyright 2004 Greg Ercolano. All rights reserved.